Tough going today if you were betting on that healthcare reform vote occurring before the long weekend. I kid, of course, we all knew it wasn't imminent, didn't we? If you have been listening to anything I have been saying for the last two months, you should have been following the activist investors, one of which notched a victory today, not more than 48 hours after revealing a stake. Chocolate anyone? It's on Dan Loeb after his agitating at Nestle SA seems to have given way to a $20 billion share buyback. Meanwhile, Marcato Capital's Mick McGuire, emboldened by a win at Buffalo Wild Wings (BWLD , has turned up the heat on UGG boots maker Deckers Outdoor Corp.'s (DECK and is seeking to replace the entire board. TheStreet's Ron Orol has the skinny on the latest from Deckers. For those trying to get ahead of some of this movement in corporate insurgency, Anders Keitz has the latest report from BoardEx, the relationship mapping service of TheStreet Inc. (TST . New data by BoardEx shows that women make up 22.2% of S&P 500 boards, yet there are still five companies without a female director, including Broadcom Ltd. (AVGO - Get Report) , which has a market capitalization of about $105.2 billion. And we are done with the discussion of Amazon.com Inc.'s (AMZN - Get Report) acquisition of Whole Foods Market Inc. (WFM right? Not so fast. Yours truly came upon an interesting take this morning from one Wall Street firm suggesting that Amazon could take a look at Rite Aid Corp. (RAD - Get Report) if its deal with Walgreens Boots Alliance Inc. (WBA - Get Report) doesn't past regulatory scrutiny. The analyst also suggested that Amazon could afford to acquire Express Scripts Inc. (ESRX but said the company could partner with Scripts or even its pharmacy partner CVS Health Corp. (CVS - Get Report) to provide more pharmacy products online. Either way, it's clear that Amazon is in the driver's seat on the changing face of retail. Who can keep up? And lets not forget about the latest cyberattack to disrupt some of the world's largest organizations. Find out how the ransomware attack stacks up against the WannaCry attack and more from TheStreet and its sister publications. Just a week removed it's hard to tell which teams won the National Basketball Association's draft. However, according to Nomura analyst Simon A. Siegel, there was a clear winner: Nike Inc. (NKE). The athletic apparel giant managed to sign four of the top 10 draft choices to contracts. But it wasn't always so easy for Nike. In February 1984, the company reported its first ever quarterly loss, and as the June NBA draft came up on the calendar it was a make-or-break moment for the Beaverton, Ore.-based company. After much negotiation, Nike would sign North Carolina stand-out Michael Jordan to an unheard of $500,000 in cash per year contract that worked out to about $7 million in total over five years including stock options, according to ESPN.com. In the first full year, the Jordan 1 shoe brought in about $100 million in revenue. In March Nike forecast that the Jordan brand could bring in as much as $4.5 billion by 2020. 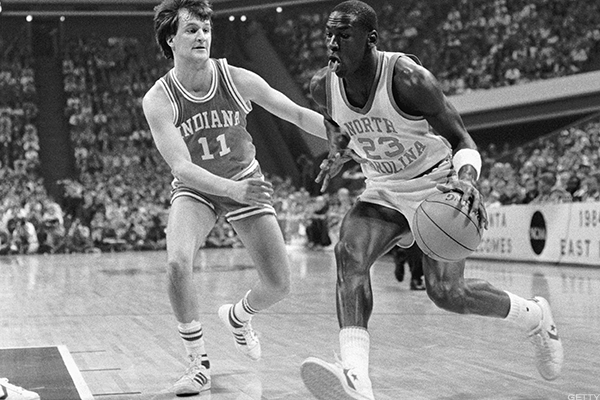 Imagine if Jordan has signed with Adidas AG like he had always dreamed or wore Converse like he did at Carolina?